As cities and citizens look to make buildings more efficient and productive, we hear over and over that it is hard to get actionable data without spending a lot of time and money. Technology may be changing that. Two technologies, Mapdwell’s Solar System and Essess’ Thermal Analysis Program, both originating from Massachusetts Institute of Technology, offer innovative approaches to improve the buildings we live and work in every day—without ever stepping foot inside. Mapdwell’s interactive Solar System platform informs building owners and occupants about the solar potential of their rooftops. It combines satellite imagery and Light Detection and Ranging (LiDAR) data to develop 3-D models of neighborhoods and cities. 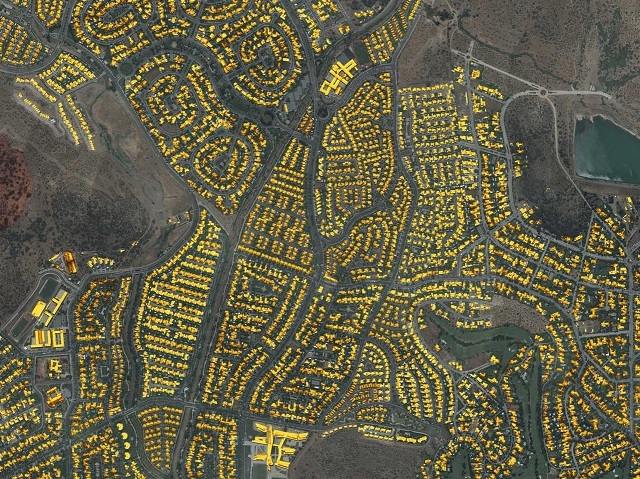 By zooming in on individual buildings and taking into consideration obstructing trees or structures, the technology determines the quantity of sunrays that can reach rooftops. Cities all over the United States, as well as two districts in Santiago, Chile, are employing Solar System technology. 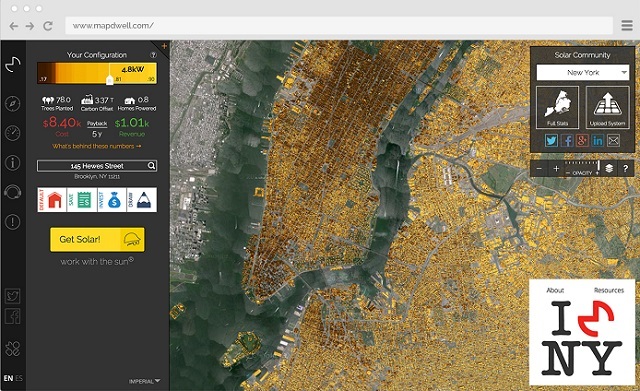 On the Solar System platform, users can simply enter their street address to obtain detailed economic, financial and environmental data about their building’s solar potential—installation cost, revenue and payback period, even the estimated offset tons of carbon dioxide (CO2) and the equivalent number of planted trees. For example, the building that houses WRI’s global headquarters in Washington, DC has the potential for a 166 kilowatt solar system with a seven-year payback period, the equivalent of 176 offset tons of CO2 and 4,100 planted trees. The portal goes even further to allow users to configure their own customized solar system, based on their individual priorities, e.g., monthly savings on utility bills or portion of roof covered with solar panels. The most notable thing about this technology is its scalability. The abundance of earth satellite data enables this technology to be replicated and scaled-up across the globe, in both the developed and developing world. Chile is already using Solar System, and the company plans to expand their international reach in the near future. But while satellite data is prolific, LiDAR data is not. It can be very costly to acquire, requiring special planes to fly over swaths of land to develop a 3-D model. If LiDAR is used for multiple applications—e.g. developing digital elevation models and delineating watersheds—it can be very cost-effective, making projects more feasible in places that may be limited on funds. Mapdwell encourages individuals and communities to “work with the sun,” be informed, generate their own energy and reduce their utility bills. But what if buildings required less energy to operate in the first place? That’s where the second featured technology comes into play. While Mapdwell’s Solar System relies on the sun to collect data, Essess’ Thermal Analysis Program requires the darkness (and coldness) of the night. Essess has developed a robust, mobile, thermal imaging vehicle system—a car equipped with a camera that takes thermal photographs of buildings while driving around a neighborhood, something akin to Google StreetView vehicles. 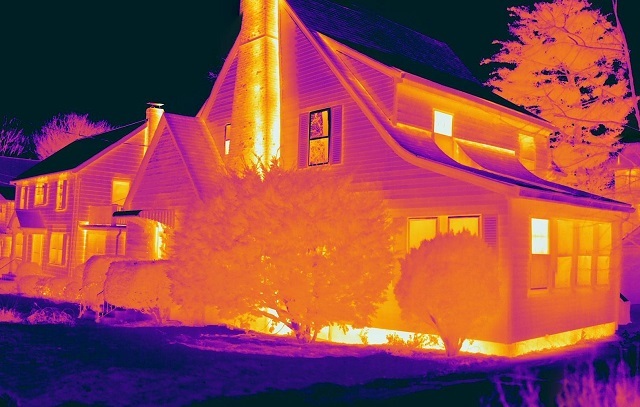 These thermal photographs capture weak spots in the building envelope—identifying energy leaks in building walls, windows, doors and roofs that simple energy-saving solutions could seal. This technology has the potential to revolutionize the building efficiency market, reducing the time it takes to conduct an energy audit— from hours, to seconds. 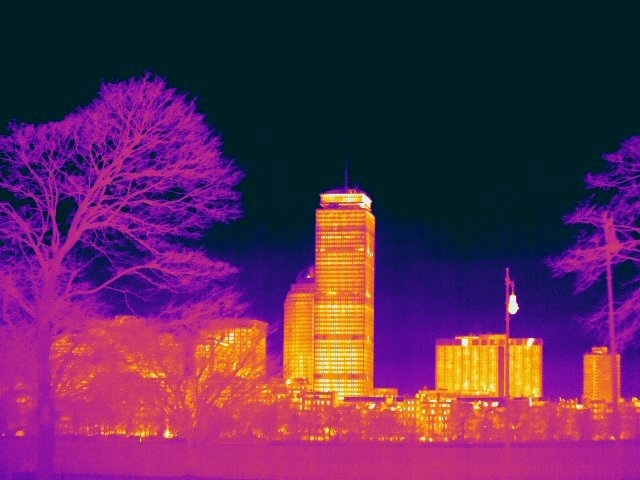 In its hometown of Cambridge, Massachusetts, Essess collected data from 17,000 buildings in 16 hours—a feat that would have taken about five years (and significant financial resources) to do with traditional energy audits. The inherent scalability and cost-effectiveness of this process make it an ideal candidate to apply in cities around the world. But, due to the nature of thermal scans, this technology is only viable in regions that would allow for a 20° Fahrenheit temperature differential between the interior and exterior of the building, a condition that rules out much of the global south. Regardless, this technology has the potential to change how we conduct energy audits – equipping building owners and utility companies with the knowledge to make better-informed decisions. These innovative technologies have the potential to revolutionize the buildings we live and work in. Scalable, cost-effective technologies like these can transform the building efficiency market – and could be even more powerful if combined, as recent research suggests.